9 luxurious air conditioned bedrooms, infinity pool, 6 staff and only 15 minutes from the airport! Dream Castle Villa is a beautiful Jamaica villa that provides a relaxing and comfortable environment, luxurious surroundings, the finest staff and numerous other amenities available on the property. The villa has a private gate and offers incredible views of the sparkling Caribbean Sea and the fabulous Iron Shore Golf Course. The lovely gardens that surround the luxury villa Jamaica are planted with exotic tropical flowers and natural fruit trees. Guests searching for a relaxing, soothing and romantic experience will feel completely at home at the Dream Castle Villa. It provides an excellent venue for small private weddings, special birthday celebrations, anniversaries, corporate retreats or any other occasion. Guests also have the opportunity to enjoy Swedish aromatherapy or therapeutic and sport massages by appointment within the private villa. The on-site manager can make all essential arrangements. Dream Castle Villa offers eight luxurious air conditioned bedrooms. The expansive 15' by 31' swimming pool is simply divine. An outdoor grill for Bar-B-Que provides mouthwatering meals. The living room is equipped with cable television, DVD and CD players for the guests. The villa rental in Jamaica also has a library with an extensive collection of music and movies. An iPod with Bose speakers, ADSL internet access, WIFI and fax machine are additional facilities available at Dream Castle Villa. Dream Castle Villa is a very child friendly villa and a nanny can also be arranged on request. An excellent staff of six very efficient and courteous persons will ensure that the guests have an extremely relaxing and indulged vacation. The beach is just one mile away from this amazing villa in Jamaica. Guests can enjoy a fabulous experience at Dr. Cave Beach in Montego Bay, which is just a 15 minutes' drive away. Those looking for exciting night life can visit the Hip Strip in Montego Bay with options including Margarittaville, Bob Sled Cafe, Casino, Jazz and Blues Bar and an excellent restaurant for lobster or steaks by the sea, the Margeurites Restaurant. Violet and Rose Suite: King bed, own sitting area, Jacuzzi, private balcony, private coffee machine, colour TV, cable, air conditioner and refrigerator. Mint Tea Suite: Queen bedroom, cable TV, air conditioner and refrigerator. Enjoy this private balcony next to our beautiful plantain trees and mint trees. Mango Suite: Queen bedroom, deluxe suite indes sitting area and balcony overlooking the Caribbean sea. No smoking inside of Dream Castle Villa. Guests may smoke on the exterior of the villa such as the balconies or outside the pool area. Maximum number of guest staying in the villa is 16 persons in 8 bedrooms. Additional fees apply to guests of $500 per person per week. Visit the famous white sandy beach of Dr. Cave Beach - only 15 minutes away. Well worth it!!! includes: sitting area, jacuzzi, private balcony, private coffee machine, color TV, cable, A/C and refrigerator. Queen Bedroom with TV/cable, A/C and refrigerator. includes: TV/Cable, A/C and refrigerator. Private balcony next to platain trees and mint tree. 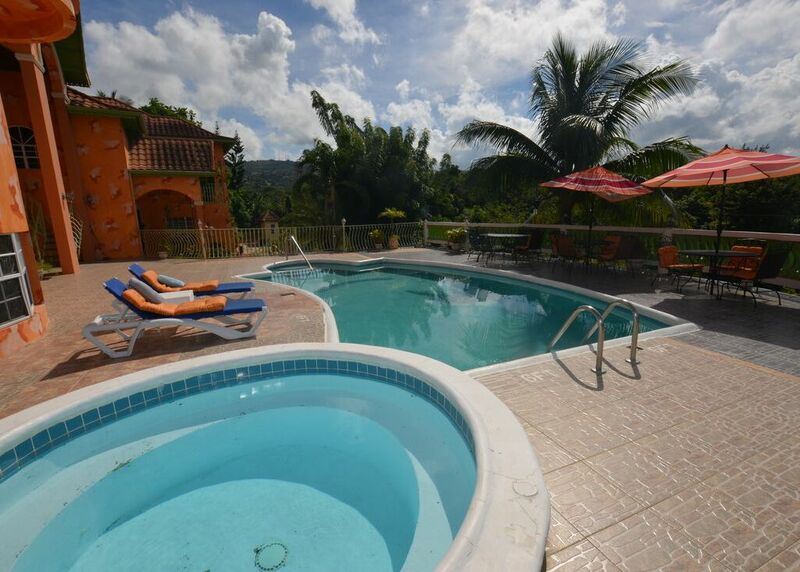 Includes: balcony overlooking the Caribbean Sea, TV/Cable and A/C. EXTRA PERSON CHARGE OVER 18 PERSONS IN 9 BEDROOMS IS $50 PER PERSON PER NIGHT.